Dell released back LCD screen size 20 inch wide support with the HDMI (High-Definition Multimedia Interface) on the Dell website, to be marketed in Hong Kong regional. Dell LCD is the latest sale price with the estimated $ 1,098, although still in range category display beginners. Model ST2010 Dell LCD will also be present in India. Hardware ST2010 LCD Dell LCD display is a TN (Twisted Nematic) size 20 inch display of support for high definition. To support high-definition display, Dell LCD ST2010 has a 16:9 aspect ratio with a screen resolution of 1600x900 pixels, and the response time in a matter of only five milliseconds. While the point of view of 160 degrees LCD display Dell ST2010 offers 1000:1 contrast ratio. Dell LCD screen ST2010 also support the HDMI and VGA connections. This means that consumers can use this LCD display to watch high definition movie format. Dell LCD ST2010 can also be driven sloping 40 degrees to 21 degrees front and back for comfort to see the display of the maximum. There's no info specification about the Dell LCD range is ST2010. 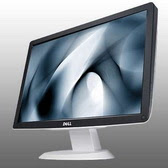 Design of a slim LCD diploay Dell 20 inch ST2010 is also compatible with the Dell XPS desktop systems and Dell Studio.